Your homes first line of defense against radiant heat gain and radiant heat loss. Consumers are able to gain better control of heating and cooling cost while enjoying the serenity of the living space. A basic law of physics is that heat wants to move to cold so in the summer, heat wants to come in while in the winter heat wants to escape. Understandably, one key to reducing utility expense is effective heat management. 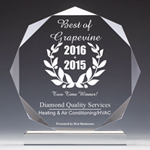 As we know there are three different classifications of heat; radiant heat, conductive heat and convective heat. Insulation is combinative of the latter two. The overall purpose of an ample amount of insulation in your home or attic is to effectively delay conductive heat loss or gain. One problem with insulation is that with increased temperature and humidity, such as we endure here frequently in DFW, the effectiveness of ample amounts of insulation are dramatically reduced. A person standing next to a campfire feels the warmth of heat on the body, whereas, a warm blanket out of the dryer is conductive. These two laws of physics work simultaneously together and are directly correlated to radiant heat and form the purpose of adding radiant barrier reflective foil to your attic space. Radiant barrier foil installation works to reflect radiant heat away from or back into the properly insulated living space thereby, allowing conductive and convective heat loss or gain through the insulation to work more efficiently, adding comfort and reducing heating or cooling deficiencies as well as utility consumption. Unlike insulation, the hotter or colder it becomes, the more effective or superior the radiant barrier foil in reducing the insulating deficiencies of the living space. We all know energy costs are rising, we don't like it but it is well known reality. Even so, we have good news! One undeniable fact is that with a Diamond Quality radiant barrier foil installation you are making an investment that is permanent, and as those energy costs rise, so will your savings!! Special note: Radiant barrier foil was the only radiant barrier product installed to be granted tax rebate status. Spray on radiant barrier paint is not a real solution to true enhancement of heat loss or gain, moreover for a radiant barrier product to be truly efficient there must be a space of airflow, between the barrier and the heat source. 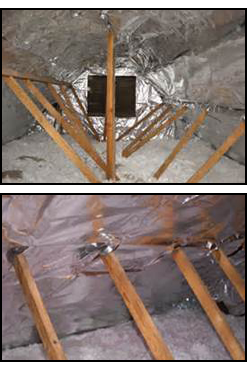 Radiant barrier attic foil meets and exceeds those standards set forth, whereas the spray on does not.